We supply replacement baghouse filters for pulse jet, shaker, cartridge, or reverse-air style dust collectors. Our filters are made to your exact specifications upon order or can be securely stored in one of our warehouses for future use. Kamakshi Engineering always looks for ways to improve your operation, cut your operating costs, or increase your filter life by offering suggestions for different fabric/finish combinations or conversions to new bag/cage styles or even to pleated filters when speaking with you. We provides clients with a free technical analysis and consultation to ensure they are getting the most out of their filters. Our experts can assist you in selecting the best filter option for your application. 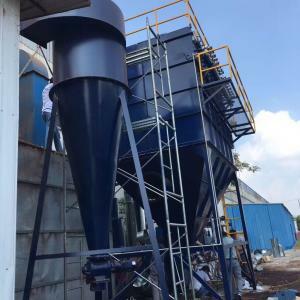 Expert in Dust Collection Equipment, Bag and Cartridge Filters Our primary expertise is in dust separation equipment, including dust collectors, baghouses, cartridge collectors, dust filters. VALE make Dust Collector Timer has been designed to operate the equipments used for dust collection purpose in modern Industries, especially in the Power, Cement, Metal & Steel Minerals Material Handling sectors. The controller is wall mounting type/ Penal mounting type and hazard free in operation. It is designed in a manner to facilitate easy operation and cost effective maintenance. Kamakshi Engineering has specialised in FILTER BAG of various types for different types of dust particle. Considering the type of dust, gas, and temperature Filter fabric is selected. We offer FILTER BAGS with Polyester; Polypropylene, Ryton and Nomax fabric. For use in dust collectors we offer FILTER BAGS in following types (1)Conventional BAG FILTER with FILTER CAGE (2)PLEATED FILTER BAG The air velocity should be maintained to allow dust to settle down inside the Dust Collector/ Bag House. Compressed air pulsing through MANIKS / ROTEX /ASCO / ASTRO / equivalent Pulse Valve should be designed for maximum cleaning with low pressure for long life of filters and to save energy. The Internationally Accepted Norms for Emission Control are : Non Dangerous Dust (like Cement) : 75 Mg./Cu. Mtr.Semi-dangerous Dust (like Carbon Black) : 50 Mg./Cu. Mtr.Dangerous Dust (like Lead) : 10 Mg./Cu. Mtr. Advantages of Bag Filter System : Maintenance Cost very low. Very High Efficiency. Heat Recovery posibility Very Good. Pleated Filter Elements Our Pleated filter elements are designed to replace traditional filter bag/cage configurations in pulse cleaning dust collection systems. It increases the area of filter media by 2-3 times that over typical bag/cage systems. This results in improved performance for existing systems, and/or the ability to reduce the physical size in the design of new systems. We offer variable pleat configurations to suit your specific operating conditions in terms of dust loading, nature of product handled, air volume requirements, etc. In addition, we can provide any technical advise you need in order to choose the proper configuration for your specific application. Pleated filter elements are available in a multitude of both top and bottom load configurations to fit most standard tubesheet and bag cup designs. In most cases, no collector modification is required. VALE Bag Filter Timer is a specially developed electronic unit for controlling cleaning cycles of bag filters available in various models to suit different output requirements. The timer energizes a solenoid valve, thus triggering the momentary pulse of high pressure compressed air down into a row of filter bags. This pulse of air will expel the dust from the surface of the filter. The timer closes the valve after a specified time and the filter starts working in the ventilation mode. Two modes of operation are available namely Continuous cycle and On-demand filter cleaning. In the continuous cycle operation the bags are continuously cleaned. The on-demand operation is based on differential pressure where as the filter bags become dirty, the differential pressure across the surface increases. If the filters are cleaned based on differential pressure they will be cleaned only when necessary reducing the number of cleaning cycles, thereby extending filter life. Interlocking is provided with the compressed air pressure switch and the timer stops if the compressed air falls below preset level. Both On-line and Off-line types are available. Use of a bag filter timer translates to faster and more effective means of controlling dust at the plant. We select Filtration fabric for maximum filtration efficiency, dust cake release and durability. Operating conditions may include changes to gas stream chemistry, moisture or hydrocarbons, or high temperature spikes to get maximum filter life and performance. The style and construction of bags are typically determined by the collector cleaning system. Valve Digital Sequential Timers offered by us are used either for pulse-jet type dust collectors or pneumatic conveying systems in either continuous or on-demand cleaning applications. The versatile sequencers are used to control 2/4/6/10/16/24/40/84 solenoid valves outputs. The advanced surface mount enclosure is reliable and provide trouble-free operation, and digital microprocessor controlled circuitry for precise pulse timing for Filterbags or pleated cartridges. The timer controls are simple to program with on/off times. All programming is done using three buttons. The controls have non-volatile memory for retaining programmed settings and a 3-digit, 7-segment display for ease of viewing controller operation.